We finally did it! I finally took my daughter on the The Polar Express at the Cuyahoga Scenic Railroad! It is the thing to do around Christmas time in the Cleveland area. 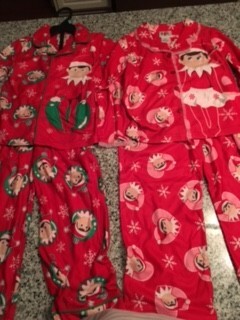 My best friend and her son went, too, and we got them matching Elf on the Shelf pajamas. It was so cute! Every kid was in their pj’s and really got into the entire theme of it. The train took off promptly at 7:00 p.m. The elf on our train read the Polar Express book, they served hot chocolate (luke warm) and chocolate chip cookies. The elves sang and dance with the kids to and from the North Pole. Of course Santa was at the North Pole and then he actually got on the train and handed out silver bells to each child as he asked them what they would like for Christmas. We didn’t arrive back to the Rockside Road train station until after 9:00 p.m., so it was a long ride. It was so much fun, but like most kid events, it could have run a little shorter. It is expensive though, at $40 per ticket for the cheapest ticket, so they probably just wanted to give us our money’s worth. I highly recommend that you do this with your kids and 4 is a perfect age! Especially since it lasts until after 9:00 p.m. We didn’t get home until almost 10:00 p.m.
Just make sure to book your tickets early next year because they sell out usually by early November.